An approach to gene therapy in which a gene editing tool is used to delete a mutated gene and replace it with a normal functioning gene was successful in mice with retinitis pigmentosa caused by two different types of mutations, researchers reported in Ophthalmology.1 This way of using the gene editing technology known as CRISPR—for clustered regularly interspaced short palindromic repeats—may lead to the ability to treat a wide array of dominant diseases in ophthalmology and other fields, according to the study’s authors. The way Dr. Tsang and his colleagues used the CRISPR tool was more agile than previous methods, so it potentially can be used to treat more patients, regardless of their individual genetic profile, he said. He calls the technique genome surgery because it can cut out a bad gene and replace it with a normal gene. Dr. Tsang said he expects human trials using the technique to begin in 3 years. The study included two kinds of human RHO mutation knock-in mouse models. The gene editing technique used dual adeno-associated viruses to, first, destroy expression of the endogenous Rho gene in a mutation-independent manner via the improved CRISPR-based gene deletion method and, second, enable expression of wild-type protein via exogenous complementary DNA. Electoretinographic and histologic analysis determined that the dual editing approach was more effective than gene replacement-only monotherapy. 1. Tsai YT, Wu WH, Lee TT, et al. Clustered regularly interspaced short palindromic repeats-based genome surgery for the treatment of autosomal dominant retinitis pigmentosa [published online ahead of print May 5, 2018]. Ophthalmology. The first medical device to use artificial intelligence (AI) to detect diabetic retinopathy (DR) has received marketing clearance from the FDA, according to a press release from the FDA. The device, called IDx-DR (IDx) uses an AI algorithm to analyze images taken with the NW400 retinal camera (Topcon). (2) the image is negative for more than mild DR, in which case rescreening in 12 months is recommended. The IDx-DR is the first device authorized for marketing by the FDA that provides a screening decision without the need for a clinician to interpret the image, according to the press release. This means it can potentially be used by health care providers who are not normally involved in eye care. The marketing authorization, issued through the FDA’s de novo review pathway, was based on a study of retinal images from 900 patients with diabetes. In that study, the device correctly identified the presence of more than mild DR 87.4% of the time and correctly identified patients who did not have more than mild DR 89.5% of the time. In a phase 1/2 single-masked multicenter study, the recombinant humanized monoclonal antibody THR-317 (Thrombogenics), an inhibitor of placental growth factor (PlGF), demonstrated safety, tolerability, and preliminary signs of efficacy against diabetic macular edema (DME), according to a press release from Thrombogenics. 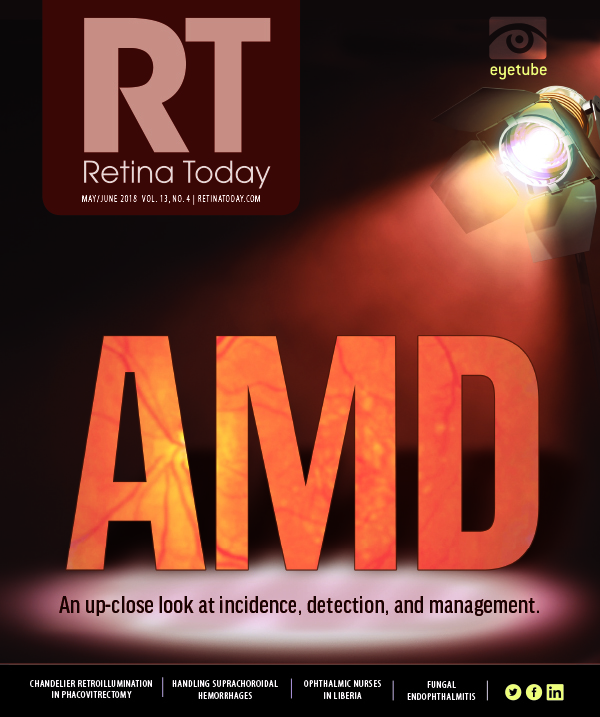 The study evaluated two doses of THR-317 in 49 patients, of whom 40 had not received anti-VEGF treatment previously. In the treatment-naïve patients, at day 90 (30 days after the last intravitreal injection of THR-317) the drug was safe and well tolerated. In addition, 30% of patients in this group who received the 8-mg dose showed a gain of ≥15 letters of visual acuity from baseline at day 90, compared with 5.3% in patients who received the 4-mg dose. The data support initiation of a phase 2 study, the manufacturer stated. “VE-3539 is the first orally dosed plasma kallikrein inhibitor to demonstrate efficacy in this preclinical model of DME,” said Melissa Calton, PhD, a scientist at Verseon, in presenting the data. The selective small-molecule plasma kallikrein inhibitor reduced retinal leakage and restored mean circulation times in a retinal vascular permeability model. It also showed efficacy in a human plasma kallikrein injection model, which mimics retinal thickening in patients, according to a press release from Verseon describing the presentation. 1. Calton M. An orally dosed plasma kallikrein inhibitor decreases retinal vascular permeability in a rat model of diabetic retinopathy. Paper presented at: Association for Research in Vision and Ophthalmology; May 1, 2018; Honolulu, HI. Optos has introduced the Monaco retinal imaging device in the US market, the company announced. The Monaco is the first ultra-widefield (UWF) imaging device combined with optical coherence tomography (OCT) capabilities, according to the company. The desktop instrument is the company’s first combined imaging device, with UWF color imaging, three-in-one color depth imaging, and autofluorescence modalities combined with OCT. The laser company OD-OS has launched a patient-information site (www.navilas.com) about vision-threatening retinal diseases. The site contains information for patients with diabetes about the need for preventive examination and treatment options—including navigated laser therapy with the company’s Navilas laser. The Implantable Miniature Telescope (VisionCare) will be distributed to Veteran’s Affairs (VA) hospitals, military hospitals, and other US federal government health care facilities by MellingMedical, according to a press release from VisionCare. The FDA-approved telescopic implant is part of the CentraSight treatment program for people 65 years and older who have been diagnosed with end-stage age-related macular degeneration (AMD) and who meet certain criteria, according to VisionCare. MellingMedical is a veteran-owned small business that provides medical supplies, equipment, devices and pharmaceuticals to US federal health facilities.